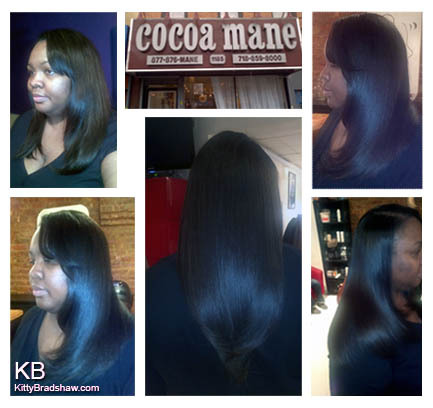 Today, I had the pleasure of going to see Janel of Cocoa Mane salon in Brooklyn for a routine upkeep of my weave du jour, lolll. This trip was extra special since me and my sister in blog Vanessa (SheSoMajor.com) will be attending a taping of the Anderson Cooper show on Tuesday. I can not tell you all how pleased I was with the final result. My hair came out so extraordinarily well, I can’t stop gushing about it in the mirror. I am certain you all can relate when I say that having a new hair style gives you a fresh perspective on life. It looks great on you Kitty! Your hair is so nice! I’m extremely jealous, man. Please pick me for the mindless behavior contest ! I really really want to meet them !!!! THEY DO HAIR SO PERFECTLY THERE THEY DON’T RUSH THEY TAKE THEY’RE SWEET TIME . Ya hair is laiiidddd huntyyyyyy…. oohh la laaaaa. I AM JUST SOOOO OBSESSED WITH YOUR HAIR !!!!! It looks so pretty, shiny, and healthy. It looks wonderful on you!